Michel-Eugene Chevreul was born in Angers, France in 1786. His career started at the age of 17 in the Museum of Natural History in Paris assisting with work on the chemical analysis of samples. In 1824, he became director of the dye-works at Gobelins, the royal tapestry factory. It was through his work there that he developed a number of theories of colour which influenced not just artists but a range of artisans working in applied and decorative arts. His interest in colour theory started with a complaint from the weavers within the factory. They claimed that samples of black thread from the dye works were different in hue or at least they looked different when viewed alongside other colours in a tapestry. Chevreul investigated and discovered that the cause was not the colour itself but the perception of it when seen alongside other colours. Based on this he produced the first general rules of the psychological effects of colour. Chevreul outlined his theory of simultaneous contrast in The Principles of Harmony and Contrast of Colours and their Application to the Arts published in 1839. He noted that the brain exaggerates differences in order to perceive them better. If, for example, two samples of the same tone, one lighter and one darker, are placed side-by-side the lighter sample will appear even lighter and the dark sample even darker than if they are viewed separately. This observation applied to both the lightness of samples as well as hues and to explain this Chevreul used the concept of complementary colours. 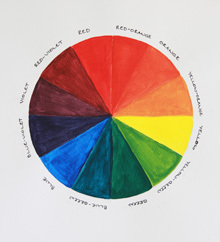 Chevreul produced a colour wheel showing colours and their complementaries. An example of a colour wheel is shown below. This, and other existing laws of colour, helped Chevreul to explain why the weavers thought that they were being given different colours of black thread. Chevreul concluded that when the black threads were placed against blue they took on an orange tint, the complementary colour of blue. Similarly, when the thread was seen against violet the black had a hint of the complementary colour of yellow. It was this perception that convinced the weavers that they been given different colours of black thread. A similar effect can be perceived with complementary colours. If, for example, red and green are juxtaposed the red will appear redder as it is being influenced by the perception of the complementary colour of green, which is red. Similarly, the perception of the green will be influenced by the green being the complementary colour of the red. With two similar colours the same rule applies – the complementary of each will affect the other. The effect is, however, different. If red is placed next to orange it will look like a more violet red because of the blue cast which the orange induces. If the same red is placed next to violet it will look more orange due to the yellow cast from the violet. Successive contrast is similar to simultaneous contrast except that the latter happens immediately whereas successive contrast is related to after-images. If, for example, an observer looks fixedly at a colour and then looks away an after-image of the complementary colour can be seen. The law of mixed contrast applies if, for example, you stare at an area of orange-red and immediately afterwards look at an area of yellow. The yellow will appear green since it will have mixed with the blue after-image of the red. This concept applies very much to large-scale or mural artworks which are viewed ‘successively’ and which, generally, have larger areas of strong colours. It is hard to gauge how many artists would have read Chevreul’s theories first hand. In many cases it would appear that they found out about his theories from secondary sources such as Charles Blanc’s Grammaire de arts du dessin published in 1867. Seurat, Signac, Gaughin and Van Gogh are known to have read Blanc’s text and, through this, came to know about Chevreul’s theories of colour. Delacroix purchased notes that someone had made at one Chevreul’s lectures. Artists may have misinterpreted some of Chevreul’s laws. In one example in his book he used a tinted ground to exaggerate the effect of a complementary colour. Artists formed the impression that they had to tint the background around a colour with its complementary but, since it is a natural effect, the painter does not need to reproduce it. Another image, showing dots which illustrated colour harmonies, is thought to have influenced the work of Neo-Impressionists working with the pointillist technique. During the 1880s there was a move away from producing a faithful reflection of nature and an interest in the organisation of the colours on the canvas. This brought about renewed interest in Chevreul’s theories. Camille Pissarro (1830-1903), Georges Seurat (1859-1891) and Paul Signac (1863-1935) began to explore a more scientific approach to colour resulting in the use of small dots of complementary colour to increase the luminosity of their paintings. Pissarro was interested in colour theory even to the point of framing his paintings in white frames that would not influence the colours on the canvas. He also tinted stretchers with the complementary colour of the most dominant colour in the image. In The little country maid light comes from the left illuminating the maid brushing the floor. Echoing the work of Chevreul, the blues of her blouse and skirt complement the ochre colours of the floor, chairs and woodwork and create a rich, glowing atmosphere. The brushstrokes appear to be loosely worked and akin to the criss-crossing balayé technique that was used by Seurat. The limited palette, of blues, ochres and creams, helps to unify the picture. The brushwork in this image shows why Pissarro was influential on a generation of young artists in the 1880’s and why he was open to the pointillist technique that was fully exploited by Seurat and Signac. This painting may have been meant as a study for Bathers at Asnières (1884). There is a stark contrast between the figure of the boy, whose clothes are painted with dark purples and blues, against the yellow-green and ochre shades of the field. The view is cropped in on the figure and he appears almost silhouetted against the field. There is a high horizon, only visible at the top of the painting, which ensures that the focus is entirely on the figure. The only other element, a cow in the top left of the picture, balances the figure in the bottom right and accentuates the size of field. The balayé technique of loose, criss-crossing brushstrokes is much in evidence in this painting. Seurat experimented with different ways of applying paint as he moved towards a more scientific approach to the application of colour. As time went on he developed the technique of small dots of pure colour applied side-by-side on the canvas, a technique that became known as pointillism. This was his interpretation of the work of Chevreul and in doing so he was working with the idea that the eye of the viewer would ‘mix’ the colours rather than the specific colour being mixed on the palette. In this image of his mistress, Madeleine Knobloch, Seurat fully exploited his pointillist technique. The fine dots are fully separated and sit alongside similar or complementary colours to create a sense of shadow and depth. This very structured approach tends to create a flat, decorative effect. Part of what Seurat aimed at was to create a greater luminosity of colour. For some subjects it does seem to work and the colour of Madeleine’s corset and the small table do have a glowing quality. The small window and decorative wallpaper give an Eastern quality to the image. Seurat, like his contemporaries, may have been influenced by the Japanese prints which were becoming more readily available. In using the technique Seurat may have overlooked the fact that, in order for Chevreul’s theories to work, patches of colour could not be too small for, at a certain size, the eye could not successfully mix the colours. Vincent Van Gogh (1853-1890) had read Charles Blanc’s theories on colour. While staying in Paris with his brother, Theo, he also became influenced by the work of Impressionist painters. His portrait of Alexander Reid shows some of these influences. The main colours are terracotta, ochres, creams and green and Van Gogh fully exploits the complementary colours. The green of Reid’s suit, and the chair on which he sits on, contrast with the terracotta background. Van Gogh uses a mix of longer and shorter slashes of colour, something between Pointillism and balayé. The sense of movement is his own and the sweep of the background is echoed in Reid’s hairline forcing the eye onto his face. There is almost a chiaroscuro effect with the paleness of Reid’s face emerging from sweeping strokes of the darker background. It is obvious from references in Van Gogh’s letters that he had a knowledge of colour theory and he had read Charles Blanc’s Grammaire de arts du dessin. Instinctively, he knew how to make it his own and, in the remaining 3 years of his life, he moved away from the flat, illustrative work of some of his contemporaries to create a style that was truly his own and an expression of his inner self. This entry was posted in Colour theory, Research points and tagged Chevreul, colour theory, laws of simultaneous contrast, Pissarro, Seurat, Van Gogh. Bookmark the permalink.